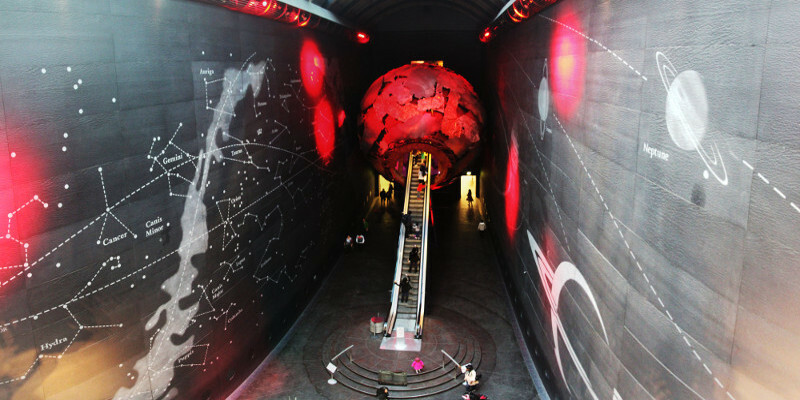 Like many visitors and tourists to London I took the opportunity to visit the London Natural History Museum. I visited this museum 19 years ago and spent a whole day there with my older step children when they were 11 and 9 years old. So I was keen to go back and share a new experience at the museum with my 15 year old daughter. Many interactive exhibits had changed, but many case exhibits looked pretty much exactly as I remembered them. I remember my visit to the Mammals room with the Blue Whale as the centre piece hanging from the ceiling. The blue whale was still there but surrounded by scaffolding being restored. I guess you expect some continual maintenaince in a museum, but I was a little disappointed. In another room there was a cabinet with taxidermied extinct species. Except that there were several exhibits missing in the extinct species display (more restoration work?) which was also a little disheartening. Don’t the Museum have multiple exhibits in storage they could move into display cabinets while items are pulled out for restoration? I found the display cases for our Australian masupials. And there I saw the taxidermied thylacine, or Tasmanian Tiger. This species was driven to extinction in the last century. A unique predator marsupial that is no longer with us. Extinction really is forever. Since European settlement of Australia just over 200 years ago we have driven at least 30 native mammals to extinction. Australia has the worst mammal extinction rate in the world with 1 out of 3 mammal extinctions in the last 400 years have occurred in Australia. The BBC reported in February 2015 that Australian mammals on brink of ‘extinction calamity’. The pace of species extinctions is increasing with climate change. With each species vanishing it leaves a poorer less diverse world. Much of the damage has come about from introduced species including feral cats and foxes, but also land use change for agriculture, more intense and larger scale bushfires since aboriginal fire-stick land management skills have largely been lost with cultural dispossession. We have known for some years that there is a Biodiversity crisis: Habitat loss and climate change causing 6th mass extinction. Scientists have also been warning the Oceans at high risk of unprecedented Marine extinction. Woinarski and Fisher (2003) also say there has been substantial loss of biodiversity in the Australian rangelands attributable to ruminants, and that this loss is continuing. As a species we may not survive either unless we rise to the occasion and rapidly address climate action. Don’t get me wrong, there were many positives about the Museum. Lots of hands on interpretive displays, great display of plesiosaurs and a number of other dinosaurs including archeopteryx. The great hall with it’s painted ceiling panels is beautiful to behold. And entry to all this is free but with a donation suggested. We enjoyed riding up through the bowels of the earth and going through all the earth and geological and planetary systems exhibits. 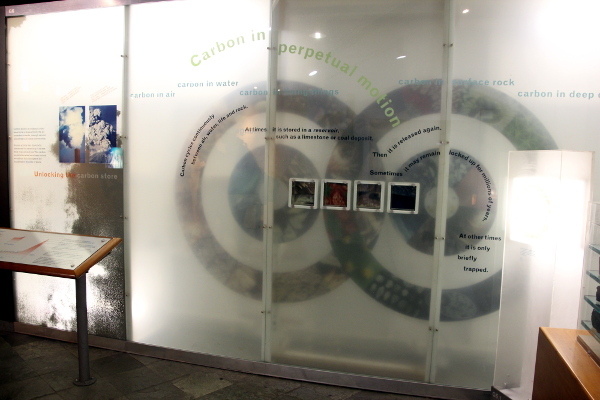 The very last exhibit in the earth history rooms was on the carbon cycle which sort of addressed climate change. But I thought this display was really inadequate to the task of explaining the anthropocene period and large scale impact of humans on species biodiversity and on multiple planetary systems as part of the earth history display. I would have thought some effort would have gone into a few exhibits explaining the anthropocene and climate change at this major museum. I know museum staff are probably overworked, but I was very disappointed there was not a more substantive exhibit on human impact changes to the atmosphere, lithosphere and oceans. Museums are supposed to educate and entertain and the London Natural History Museum have really missed an opportunity here with climate change and human impacts on planetary systems. Especially this year, in the leadup to the UN climate talks in Paris, a pivotal conference addressing action on climate change. 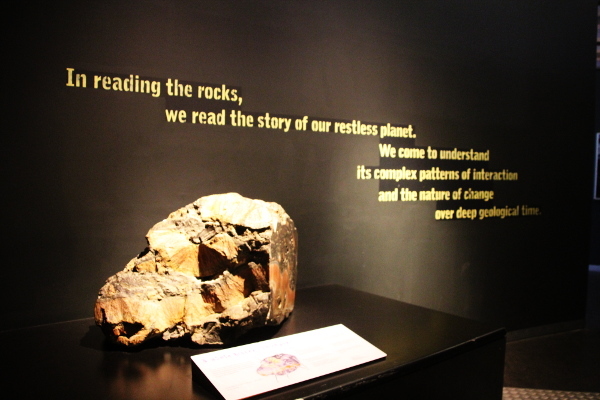 Of course the Museum has far more resources online including a gateway page on unprecedented environmental change, but it was missing the power of a real world exhibit where people could interact and interpret the science. 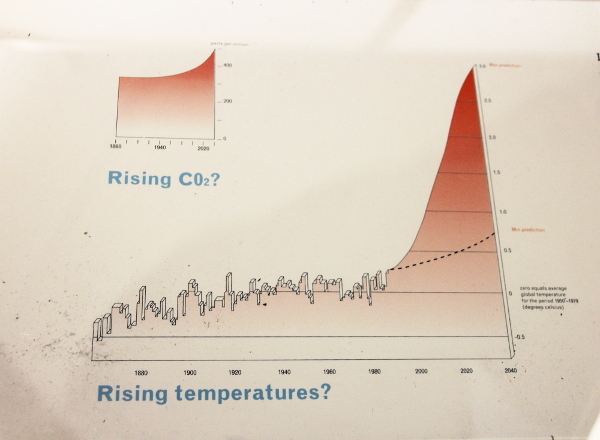 So I came away from the Natural History Museum a little disheartened and disappointed that professional science communicators had really missed an important opportunity explaining the anthropocene and climate change as part of the earth history exhibits. The increasing pace of loss of biodiversity, species extinction and climate change should worry us all. Latest research by Forest Isbell et al (2015) – Biodiversity increases the resistance of ecosystem productivity to climate extremes – details that biodiversity provides important resistance and resilience to ecosystems during climate extremes. Every time we reduce biodiversity through extinctions, we reduce the resilience of ecosystems to respond and recover from extreme events. I am sure Charles Darwin, a statue of which stands in the great hall, would be puzzled over the lack of science education exhibits on climate change, the modern day equivalent controversial subject in comparison to the ideas on evolution mapped out in The Origin of Species.